The abundance of wheat in the south of Italy means pasta is plentiful in Puglia. From dinky orecchiette to pod-shaped capunti, here are a few of the pastas you can expect to see if you’re heading into the heel of Italy. 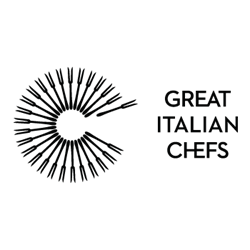 Great Italian Chefs is a team of passionate food-lovers dedicated to bringing you the latest news, views and reviews from the gastronomic mecca that is Italy. Pasta varies hugely from the north of the country to the south. In the north, chickens are easier to keep and eggs are more plentiful, making fresh egg pasta far more common. Historically in the south of Italy, using eggs in pasta was seen as a luxury that many could ill afford – fresh pasta was strictly reserved for Sundays and special occasions. The people of Puglia and surrounding regions made their pasta dough with a simple combination of flour and water, and relied of the abundance of good wheat and incredible produce to add flavour. That austerity is a thing of the past in most places, but the pugliese still prefer to make their pasta the old fashioned way. Puglia is home to lots of unique pasta shapes, many of which are still made completely by hand. Some, like orecchiette and cavatelli, have gained more widespread popularity across the world, but there are plenty of others to discover. 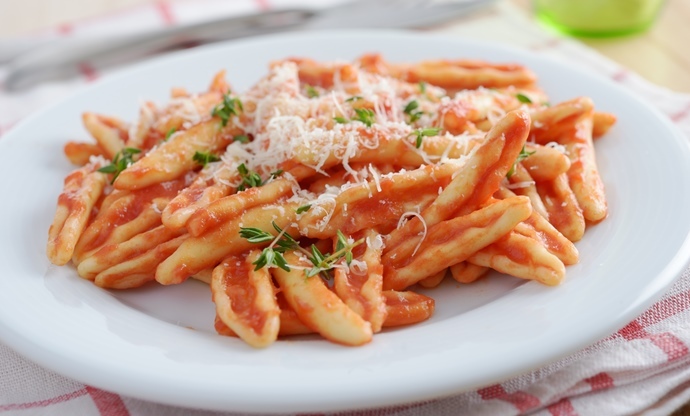 Take a look below for our primer on the unique Puglian pastas to look out for when you visit! Translating literally as ‘little ears’ in Italian, orecchiette are extremely typical of Puglia. 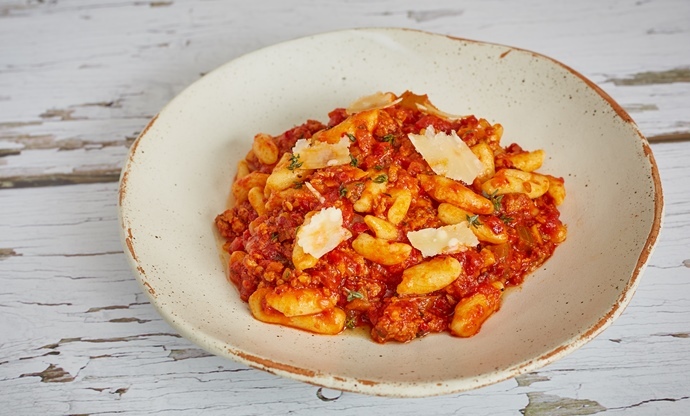 The pugliese dish of orecchiette alle cime di rapa is a regional classic, and undoubtedly the first thing you should look out for on your travels, but you’ll often see orecchiette served with tomato al sugo – a fresh tomato sauce. 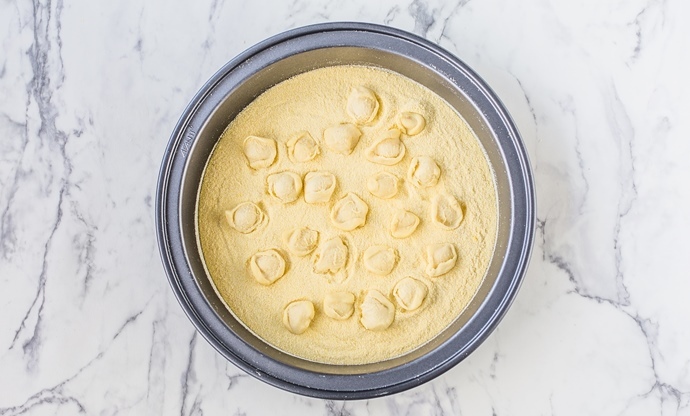 Orecchiette is hand-shaped so it’s really simple to make at home – just make your pasta dough, take a small marble-sized ball of it, and then roll it against a flat surface with your thumb to create that recognisable dimple shape. Troccoli is very recognisable to the English eye – we likely would mistake it for spaghetti if we didn’t read the menu. The two are very similar, but troccoli is generally a little thicker, and has a square cross-section due to the way that it is made – more like spaghetti alla chitarra. Instead of using a chitarra to cut the strands, troccoli is made using a troccolo – a grooved rolling pin that cuts the pasta into strips. Troccoli in Puglia is often served with a good meat ragù, pesto, or with the ever popular cime di rapa. 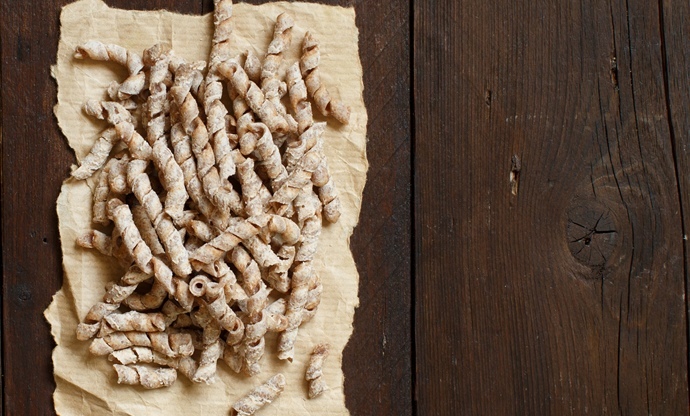 Cavatelli are not all that different to orecchiette – they’re almost used interchangeably throughout Puglia, but the former are a slightly different shape. Cavatelli translates as ‘little hollows’, and whilst the ‘little ears’ of orecchiette are more delicate, cavatelli tend to be a little more puffy, almost like a gnocchi, but with a hollow made from the side. 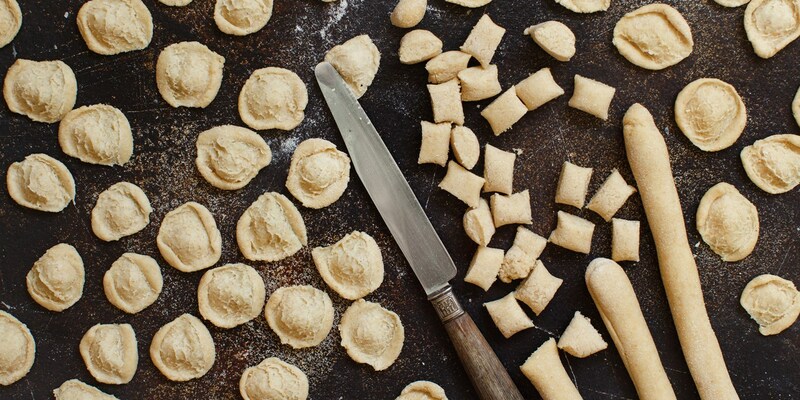 Sometimes pugliese will make cavatelli dough with ricotta, effectively making these into hollowed-out gnudi. Again, they’re often served with garlic and cime di rapa, broccolini or tomato. If you see sagne a bit further north, it sometimes refers to a flat pasta – almost like a lasagne sheet, but cut into squares. 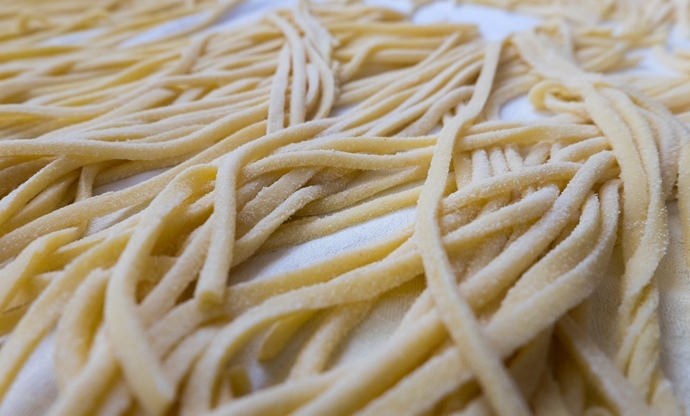 To make sagne in Puglia, they cut strips of rolled pasta dough into fettuccine, and then wrap them around a thin dowel into a spiral, creating a rolled ribbon of pasta. Typically in Puglia this is served as ‘sagne ‘ncannulate’ – the pasta is boiled, and tossed in a sauce of tomato and garlic, with plenty of ricotta strewn over the top. Capunti is often said to resemble an open pea pod – think a conchiglie pasta shell, but stretched longways. Again, these are popular all over Italy, but you’ll see them more commonly in the south along with variations like capuntini – a smaller version – and fricelli – where the pasta is rolled all the way around into a loose tube. Capunti suits meat and fish-based sauces very well as the concave pasta holds chunkier fillings very well, but it’s served in all sorts of different ways in Puglia. Sign up to our newsletter now and we'll send you a hand-picked round-up of the best features and recipes from across Great Italian Chefs each week.